July 4th – 7th 2019. August 15th – 18th 2019. Taxes and service fee not included. Includes 3 meals a day, guides, housekeeping, boats, motors, traditional sporting cabin on the lake. Bring rain gear and waders. Whether you’re a beginner or have been fly fishing for years, our three day fly fishing schools will provide you with fishing knowledge and skills that will add to the enjoyment of your fly fishing adventures for years to come. 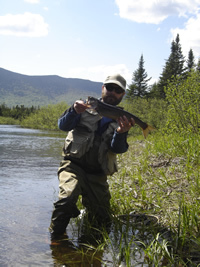 Our instructors are registered State of Maine guides and some are certified FFF instructors. Each are experienced fly fishermen and have an intimate knowledge of our lake and rivers and will be with you during your stay to answer questions and offer suggestions and make sure you have a rewarding and fun Kennebago experience. On a daily basis you will meet with your guides for a couple of hours for an indoor class. Subjects discussed: Equipment; Rod and Line Weights and what they mean; Knot tying; Lake and river entomology; Dry flies, Wet flies, Nymphs, Streamers and what insects they represent and lessons where you will tie your flies for fishing. 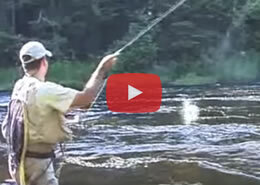 After the first mornings class, you will head outdoors for fly casting instructions. 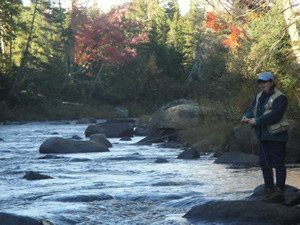 These casting classes are individually tailored to your abilities from basic casting, tips for longer cast to the more advanced techniques of roll casting, the double haul, and how to fish a shooting head. Over the three days you will fish the river, the lake and the Logan, each with its own set of challenges. 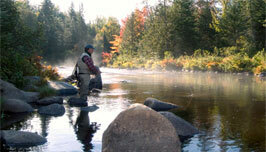 You will learn how to read the water and discover the differences between fishing the pools and fishing pocket water. Each day ends back at camp for a great home cooked dinner and the swapping of fish stories. You are sure to have some, after an afternoon on the river! In the evening is a great time to test your skills out on the lake. Your Rangeley boat, with motor, is at your dock, right out in front of your camp. At this point there is a pretty good chance you will have the experience of a Tight Lines with a brook trout or salmon on your fly. Most of our fishing is Catch and Release but once in a while it’s nice to bring one in and let your dockman clean it, so the cook can prepare it for your next morning’s breakfast! Call for additional information and rates. Private lessons also available. 1-800-633-4815.